Got this email from a mate in the north east today. The action taken by the government officials is disgusting in my mind. The email and pic below say it all. This made me want to throw up! They could have doubled the game limits and opened Stennis for nine hunts. That would have accomplished the same thing. HANCOCK COUNTY, MS (WLOX) - The vast woods of Stennis Space Center 's 13,000 acres are home to hundreds and hundreds of deer. There could be as many as 1700 to 3200, according to Stennis Director Gene Goldman. "We've got about twice as many deer as we should." And, Goldman says, that's a problem. First, deer can dangerous.. Signs are a testament to past accidents. But Goldman says the biggest reason Stennis needs to control the deer population is to protect the herd. "The fact that we're seeing malnourishment at this point is indicative that we are taking the right steps at the right time," Goldman said. Members of local hunting clubs are upset at how the deer are being killed. "They're taking 200 head at night in means of head-lighting and they're shooting them in the head. The deer don't have a chance," hunting club member Gregg Lichtenstein said. "If I go headlight a deer at night, they're going to confiscate my truck, my guns, I could serve time. There are other ways to manage a deer herd than shooting a deer." Stennis leaders say they looked at other solutions. "We considered a range of options including potential birth control for deer, to allowing the deer population to take care of itself," Goldman said. "The state currently doesn't allow relocation because this overpopulation of deer exists statewide." Hunting club members are allowed to hunt in the Stennis buffer zone three times a year, and aren't happy that state hunters are encroaching on their sport. "We spend a lot of our time with our kids to keep them off the streets and come out here and enjoy this land and hunt on this land like they are supposed to," Lichtenstein said. Lichtenstein says leave the deer alone and sport hunters could control the herd. But Stennis officials say that hasn't happened, and this is the best solution. "Anytime we start removing part of our wildlife, we want to do it as humanely as possible. We believe what we did was make the most human decision that could be made," Goldman said. "This is not a case of deer hunting." Hunting club members have contacted Congressman Gene Taylor's office in hopes of getting him to stop the government's killing of deer at Stennis. More morons, that is sad, and disgusting!!! There is something wrong with this picture !!! You cull a heard by shooting the does not the bucks !!! There is truth to this story without a doubt. Sounds like this took place late January early February of this year. I don’t believe the picture goes with the story!!! And I forgot, Whats up with the pig ??? HANCOCK COUNTY, Miss. (AP) - Hunters in south Mississippi are unhappy with the way officials at the Stennis Space Center are dealing with an overpopulation of deer on the center's 13,000 acres. Gregg Lichtenstein, a member of a Mississippi hunting club, said government hunters are killing the deer at night, using the normally illegal method of headlighting. Hunting club members are allowed to hunt in the Stennis buffer zone three times a year, and aren't happy that government hunters are encroaching. Stennis Director Gene Goldman says the deer population needs to be thinned to prevent accidents and protect the herd from malnourishment. 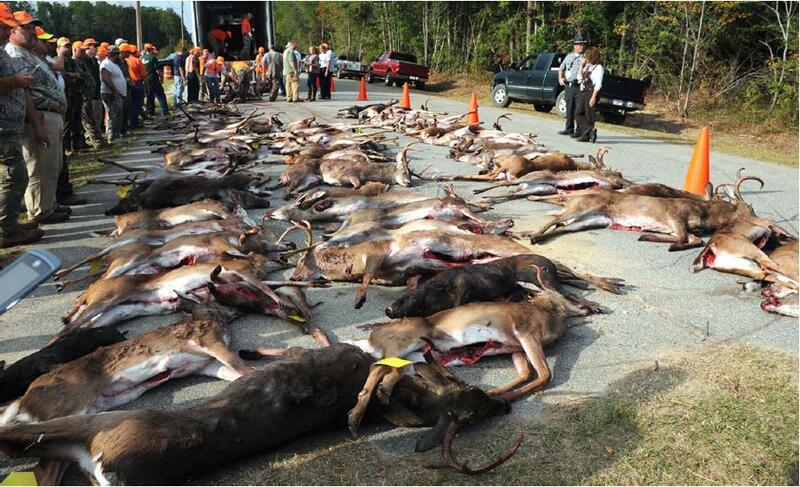 The meat from the deer kill is distributed to food banks around Mississippi. That is the original report from AP from what I can tell. It's like the morons we have over here - they PAY "professional hunters" to control deer on government land instead of offering the cull to those of us who have a damn' sight better idea of which animals to cull in order to improve the breed & limit the stock at the same time. We can't be having people gain a measure of satisfaction out of this now can we? The Space center's land is 13,000 acres yes. But the buffer zone hunters are actually allowed on is 125,000 acres. Not to say the government culling of the deer is the best thing but remember. In the 13,000 acres hunters are more then likely barred from crossing the fences as its government property related to American National Defense. The way I see it the local hunting clubs have not killed enough of the deer in the 125,000 acres to make a difference on the 13,000 acres the Space Center is on. Therefor what makes them think it will be any different if the government didn't do this to cull the deer populations? Plus they are DONATING the meat to the local food banks which is always good compared to simply letting it spoil. The bag limit on antlered buck deer is one (1) buck per day, not to exceed three (3) per license year. The bag limit on antlerless deer is one (1) per day, not to exceed three (3) per license year; except that two (2) additional antlerless deer per license year may be taken with a bow and arrow. Maybe they should consider upping the bag limit. They aren't trying to "hunt", they are culling the herd in the most efficient way they can, as pointed out by Mr. Goldman in the article. Obviously the current hunting season/bag limits/hunter interest/etc. are not keeping the herd at an optimum, healthy level. Do I think they should change those things to improve the situation? YES. Am I upset by the methods they used this time? No. They thinned out the herd some and provided meat for the hungry.